Congratulations to George W. Bush, President-Elect! With the results all tabulated, the Monaghan Pipe Band has ranked in a tie for third place amongst grade three bands in the Eastern United States Pipe Band Association. This ranking places Monaghan well into the top ten percent of the association's 157 registered bands. Former Monaghan piper Gerry Damon brought out his newly formed Putnam County Sheriff's Department Pipe Band this past season and ranked an impressive fifth in grade five. Former Monaghan lead drummer John Mulligan anchored the drum corps. Congratulations to Gerry, John, former Monaghan piper Jim Feeley, Brendan O'Reilly (Monaghan drummer on sabatical) and the whole Putnam crew for their great debut season. In solo categories, Monaghan's Rich Janniello ranked fifth in grade three drumming. Andy Hamilton ranked eighth in grade two drumming. Monaghan's Thomas Munks ranked third in grade four junior piping. Congratulations to our ranking players. While the world was watching Florida count ballots, the EUSPBA held a swift election based out of Virginia. Monaghan's Drum Sergeant, Martin Duffy, was elected to the position of officer-at-large for the Eastern United States Pipe Band Association's Executive Committee. Martin will take part in governing what has become a very progressive pipe band association recognized throughout the world. Martin also serves as the vice chairperson of the EUSPBA's Metro Branch. As the days approached toward the counting of the ballots, Eammon Radburn of the Bergen County Fire Fighters Pipe Band told Martin "I meant to vote for you, but I think I voted for Pat Buchanan by mistake". Despite voter confusion, Martin won the post. Albert McMullin, from Georgia, won the presidential election. Albert has been part of the EUSPBA's back bone for many years. We wish him well in leading this fine organization. Robert Caudill was elected vice president and Vince Janoski was elected Recording Secretary. They join executive secratary Carole Hackett, treasurer Arthur McAra, officer-at-large Chris Hamilton, and Doug Ross who will serve as both the Adjudicators' Advisory Board Chair and the Advisory Committee Chair. Good luck to our officers! The Monaghan Pipe Band is thrilled to welcome back piper Peter Skae. 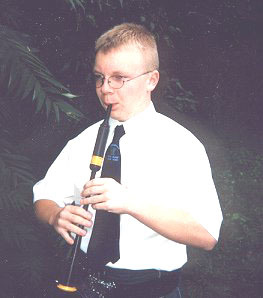 Peter is an open/professional piper and would be a huge addition to any pipe corps. Peter Skae is the third open piper the band has added to its ranks in the past year. Welcome Peter! The Monaghan Pipe Band is pleased to announce that John Wassman has come aboard as the band's new Pipe Major. After teaching the band for two years, John comes aboard eager to bring the band to the next level. John Wassman is an established solo player, bandsman and judge. 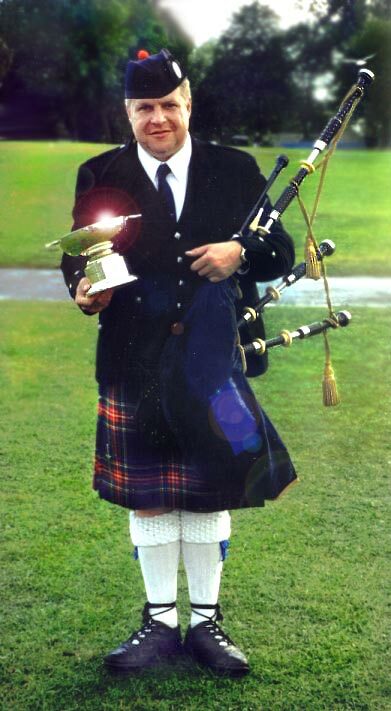 A student of Pipe Major George M. Bell, John has competed extensively as an amateur and professional, playing throughout the United States, Canada and Scotland. As a bandsman, John Wassman has contributed his skills to two of the best bands this country has ever seen. A founding member of Parlin & District, John was a key player in this band as they dominated the U.S. 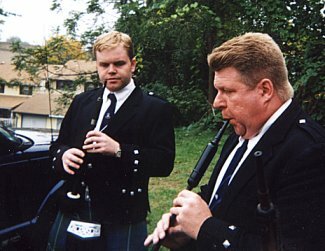 Piping scene for many years and won the grade two North American Championship in 1984. John would then participate in a marvelous six year run with Parlin in grade one. John has also been a key member of the City of Washington Pipe Band, which is now one of only two U.S. bands in grade one. John played with City of Washington when they won the grade two World Championship title in 1999, as well as several North American Championships. John continued to play with COW through their powerful first year in grade one this past season, which included a second place at the North American Championship. A much sought after teacher, John also serves as an EUSPBA panel judge for both piping and ensemble. On taking this position, John commented "After instructing the band for two years and seeing the potential the band had to offer, I accepted the challenge and responsibility of being Pipe Major." In serving as the piping instructor, John played with the band in three competitions this past season. This helped propel the band to take a second place at the Montreal Highland Games and a first at the Hunter Mountain Festival. The band is looking forward to John in its ranks and hopes to benefit from his knowledge and experience. Welcome Pipe Major John Wassman! John Wassman leading a chanter practice, with Eddie Cameron on the left. Welcome to new members Bob Hanley, Joe Korber, Thomas Munks, Jared Brogan, Tom Colgan, Timothy Brunton, Pat Timmins, Alex T. Young, J.C. McMenamin, and Chris Jones. Welcome back to TJ Hagan, Peter Skae and Andy Hamilton! when he made his debut at the Celtic Classic in Bethlehem. The Monaghan Society honored Pipe Major Thomas Hoins at their Annual Dinner Dance, on Saturday October 14th. The event was held at Rory Dolan's Restaurant on McLean Avenue, Yonkers. Tom has lead the Monaghan Band since its rebirth in 1991. He brought a world of experience with him from his playing days with two of Ireland's best bands; St. Patrick's - Donaghmore, and Ballinderry Bridge. The band joins the Monaghan Society in paying tribute to someone who will always be a key figure in the band's history. In Monaghan's seventy years, Tommy is the first pipe major to bring the band all the way to grade three. On Saturday September 16th, The Peekskill St. Patrick's Committee held their annual parade with Grand Marshalls Ann and Joe Brady, Junior. Joe, a Monaghan Piper, and his wife lead the parade through Peekskill, New York. In addition to the grand marshall sash, Joe wore his Monaghan kilt, and was followed by the Monaghan Pipe Band. 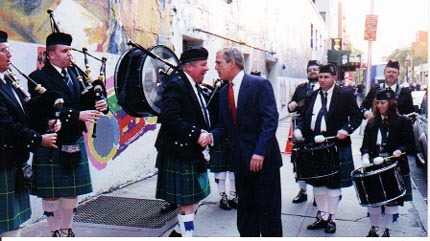 In addition to being a world renown piper and drum major, Joe is the personal piper to Governor Pataki and leads the New York City St. Patrick's Parade as the 69th Regimental Piper. 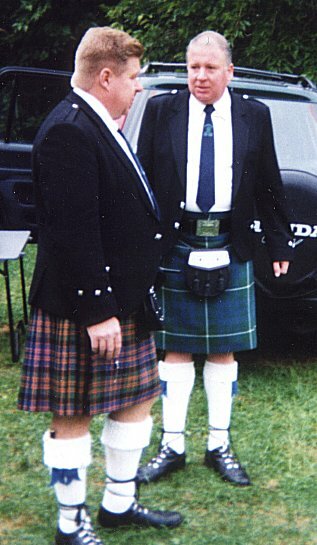 He is also the founder of the FBI Pipe Band. And while the community of Peekskill might not be aware of this, Joe was a seventeen year member of the Worcester Kiltie Pipe Band, which historically and presently is one of the countries top pipe bands. But being a top piper does not make one a grand marshall. Nor would Ann Brady's successful run as a Champion Tenor Drummer. Years of community service lead to this honor for the Bradys. Joe served as a City Councilman for Peekskill and served as the Chairman of the Peekskill Republican Committee. Ann has been a most noteworthy community activist. She has been a primary supporter of the school's teams, Vice President of the parents' club, and a basketball coach. Ann serves on the Hall of Honor Committee and the Reader's Digest Tall Trees Committee. The Monaghan Pipe Band extends their congratulations to the Bradys. We are also thrilled that Joe, a Bronx Native who grew up on Frisbey Avenue, makes his way back to the Bronx on a regular basis to play with our band. Two of the EUSPBA's finest, John Wassman (left) and Joe Brady, Jr.